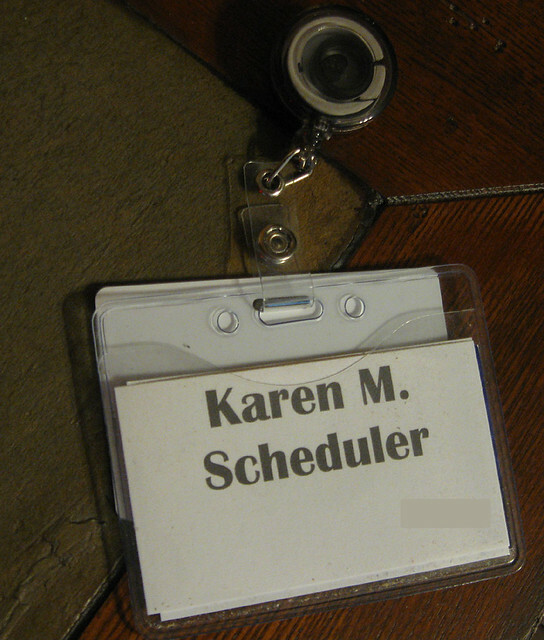 My co-worker was checking a patient out the other day and her name badge had flipped over so that you could see her first name, her last initial and scheduler under neath it – like in the picture above. Patient: “Are you German?” the patient asked again. My co-worker was stumped. She had no idea why the woman would ask her that question. It took my co-worker a few seconds before she finally figured out that the patient had thought her last name was Scheduler!! And my boss, who happened to be walking by at that very moment, tripped and had to run back to her office because she was laughing so hard, she was crying.